We are not usually pessimists but when we see the writing on the wall getting bold redder each week that passes, we can't help but to take serious note. Just last week, we warned readers that markets might be about to get nastily volatile during the summer. So far so bad. May hasn't started well at all. The S&P 500, as of the week ending this past Friday, posted its first 3-week losing streak since January. The VIX has finally gone above 15, and the U.S. dollar index has been breaking the chain of shorts in the past 2 weeks, wiping out many bears in the process. As portfolio managers, we have been flipping from short to long repeatedly in 2016. The environment remains markedly difficult to navigate and although the markets are aware of the many known unknowns, the sheer diversity and quantity of these unknowns have led to nervousness in the markets, and that has been reflected in abnormally non-directional price action in various asset classes. Volatility is a given. Recent macro developments both in the U.S. and elsewhere have however strengthened the bearish case for risk, in our opinion. It might have reached a point where downside skews in risks make a derisking maneuver potentially more rewarding than chasing beta. We use a series of anchor points for our analysis as directed by our approach to the markets. The "3Ps" of Positioning, Policy, and Profits remains a fundamental cornerstone in our framework. All 3 are currently not in favor for higher valuations, which translates (in typical market sense) to weakness in risk, and strength in liquidity and perhaps even quality/safety. Positioning has recently turned slightly negative with institutional players selling rallies in equities, shorting USD, and being very long in precious metals (short USD). Duration has been bid but remains mild compare to the extremes seen in the USD. The capacity for an abrupt turn in prices triggering simultaneous covering of these crowded positions is certainly present and poses a sizable threat for risk. Policy measures by central banks might have already been exhausted. Risk markets will likely not react positively to additional monetary stimulus the likes of QE or lower/negative interest rates. See ECB vs. euro & European equities; BoJ vs. yen & Japanese equities. Read more in the next few sections. Profits in America Inc. are already in a downturn. There will likely be a dearth of micro drivers to support elevated valuations, leaving multiple expansion and corporate buybacks as the only real bullish forces — both of which have already been running their courses for a good part of 5 years. An earnings recession doesn't equate to higher valuations, absent an exogenous shock which we don't see coming. As such, we have shifted our bias to the short side of risk. The positions in our portfolio (which we keep private) have partially reflected this change in view and will continue to do so as the situation evolves. Here are some of the known unknowns the markets currently expect. While the occurrences of these events are a given, the outcomes aren't. June FOMC. The Fed is not expected to hike rates during their upcoming June FOMC meeting. FF futures imply a 4% probability of a hike, but according to May's FOMC statement, we believe that there is a sizable risk of a hawkish Fed which, even absent a hike, has the potential to rattle markets. Policy uncertainty here (even if isolated to the U.S.) is impeding on investor confidence. Fed is being seen to remain highly data dependent and sensitive to macro. See next point. "Is the Fed right to say that markets have misjudged its ability to raise interest rates both higher and quicker than expected? Well, the markets say the Fed is wrong on that. The gap between the market implied FF rate and that implied by the FOMC's "dot plot" is widening. For instance, the dots say FOMC officials see on average 2 more rate hikes this year while the market only expects 1. This discrepancy only widens the farther out we go. Also, stocks have deviated far away from GDP growth expectations, likely because the transmission that are interest rates and monetary policy have become so broken, the market refuses to trade on fundamentals and are rather technical driven. Lastly, whatever happened in March threw the balance between yields, stocks, and macro data totally off. All 3 have been divergent since and only one will ultimately be proven correct. So which is it?" Uncertainty surrounding U.S. macro. Economic data has generally been atrophying since March with employment and labor market indicators turning lower, catching up to softness in other points of the economy. Manufacturing activity points to much slower growth than what retail activity suggests. Build up in inventories signal a recession, but relative strength in the labor market and pick up in wage inflation partially counters those negatives. Various regional Fed banks have also downgraded GDP growth forecasts for 2016. Market based expectations have likewise been on a decline since the start of the year. Macro reverberates back to policy in a feedback loop. See previous point. "Yellen, we REALLY have a problem. After last week's utterly disastrous NFP report for April, one would have thought the slew of bad data would have seen some respite. Bad news, it got worse. Jobs, the only true strong pillar of the much peddled U.S. economic recover, has recently been rolling over in earnest. First it was PMI and ISM employment indicators to turn lower, then layoffs, as reported by employers themselves (companies and businesses) started rising, then it was the ADP and NFP reports, and now the weekly initial jobless claims are seriously starting to freak the uber hawks out. Once at a 43-year low, claims have staged a sharp rise to 15-month highs with 294,000 claims vs. 270,000 expected for last week. As can be seen, jobs have seemed to lag other key macro indicators such as industrial production, retail sales, and durable good order, ect... Quite surprising given that the labor market often tends to lead the pack, or at least that's what's being taught in textbooks in schools all around the world. Better buckle up, the rosy situation might be turning..."
UK EU membership referendum. Brexit or no Brexit, this is a major event risk that has been confounding European and British markets. The GBP has been most directly affected and volatility could easily spill over to other risk assets. Current opinion polls show an almost neck-in-neck tie between both sides. We note that after Obama's visit to Britain earlier in April, Brexit odds have risen notably. This will remain an uncertainty for the markets until mid-June when the English will take to the ballots to vote on England's future in the EU for the first time since the trade and continental bloc was founded. Monetary policies. The BoJ spoke markets and sent the yen rallying (risk tanking) when it failed to ease policy in April. Markets are still expecting a looser stance from the BoJ and have been discounting that possibility after the initial negative surprise. The ECB is also expected to ease when its governing council members convene to decide on monetary policy later in June. The onus is on Draghi to lower interest rates further, but there are doubts that he will do so. especially after having just boosted the PSPP in March. Uncertainty in what the major central banks might do next is a key driver for volatility which limits excess returns. Currencies have also started to react differently to monetary easing. U.S. presidential election. This isn't a major event risk for markets but will still be affecting sentiment. Uncertainty builds up as we near Election Day, especially so when the race between Trump and Clinton heats up. More on this at the end of this piece. Here are some of the known knowns the markets currently face. Consequences from these have likely not been fully reflected in asset prices. U.S. corporate earnings recession. We have talked about this in our previous piece on Insight. Investors expect EPS growth to slow significantly for the S&P 500 index as a whole, and valuations to catch down as a result. Micro drivers are few and far between, as we have seen so far this year. Negative surprises by way of earnings misses and lower guidance far outnumbered positive surprises. Apple Inc., once the world's most valuable publicly traded company, has been dethroned by Alphabet Inc. (Google), falling 17% since its pre-earnings cycle highs, and down 30% from 2015's all time highs. "Are American stocks expensive of cheap relative to 144 years of history? This chart holds the simple answer. 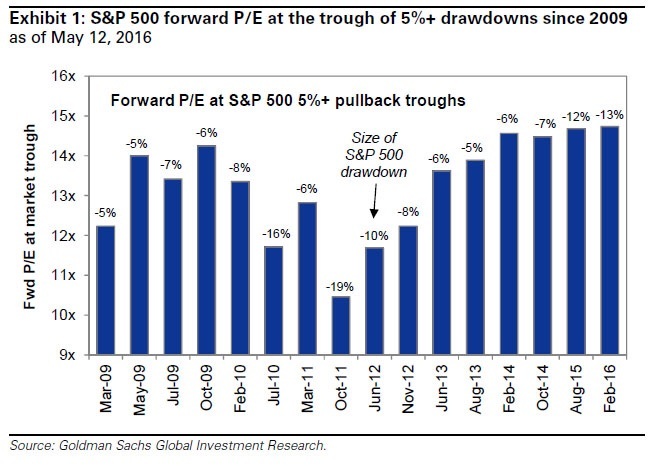 The longest term average P/E for the S&P 500 is 15.6x. The current trailing P/E is 23.7x. This puts the current standing in the 95th percent tile of all record months over 144 years. P/E ratios have only been higher than today's level 6.1% of the time since 1871. So you decide if stocks are cheap or expensive..."
China concerns. As the world's second largest economy, China remains a heavy weight on the balance of global risks. Said risks are skewed downward for China. Growth concerns, a property market that is still deflating, massive swings in credit creation (the most important factor for growth in our opinion), central bank policies towards the yuan and interest rates. Yuan policy garners reactions from other regional central banks, and they too have started to tighten FX pegs and loosen policy language. "China's credit growth (new CNY loans & social financing) slowed very sharply in April from March's blistering increase. Why does this matter more than anything else? Because if you even bothered to look at why the world's second largest economy has been able to "growth" at such officially-reported (or claimed) rates, it's been mostly due to the breakneck speed of which credit has been expanding. Credit fueled growth, that's what it is. Earlier Friday, China reported that total social financing (TSF) for April fell 70% from March, coming in at RMB751bn (still very high) vs. consensus expectations of RMB1.3trn. New CNY loan creation also slowed sharply in April to RMB556bn vs. consensus expectations of RMB809bn. To place things in context of how insanely volatile the credit growth situation in China really is, January saw TSF increase by a whopping 63% YoY. April saw TSF fall by more than 15%. That's a delta of nearly 80% in 3 months. Go figure. Also, M2 growth slowed in April and money velocity fell, indicating that consumption has probably also fell. Watch this key metric each month because we strongly believe it's what holds the Chinese economy together. Should we see consistent drops in credit growth, you know almost certainly that the world's second largest economy and largest producer of exports is in deep water. "Slower credit growth in April was likely the partial result of tighter liquidity conditions in the interbank market. Administrative controls might have played some role as well. Higher yields and credit spread may also contributed given the decrease in corporate bond net issuance under TSF. There were also some crowding out effects of very large amount of local government bond issuance which were mostly bought by banks. April money and credit data indicate that tweaking of the policy stance likely started in April, before the late April Politburo meeting and early May People's Daily editorial suggesting less stimulative policies. Such a change is unsurprising given the rebound in activity growth,rising concerns about inflation and leverage. To what extent the latest policy comments will have additional impact on policy in May and beyond is uncertain, but we believe 2Q policy as a whole is most likely to be less supportive than 1Q. Domestic investment demand growth as a result will likely receive less support."" Higher oil prices. One Risk that has mostly been overlooked by analysts is the 65% surge in crude prices since bottoming out in February. Prices at the pump (and including gasoline, diesel, jet fuel, distillates) have risen more than 30% on average, and have affect U.S. consumer sentiment negatively. While the rollover effects of higher energy prices on the economy are debatable (growth and inflation implications), markets are very late to discounting these potential implications, and their consequences on monetary policy. Volatility in FX. Wildly swinging exchange rates are never good for risk markets. The dollar, even after having retraced part of its huge YTD drawdown, is still the biggest wildcard in town. Uncertainty in central bank policies feeds into this via a feedback loop. As mentioned in the onset, we have started to be bearishly biased risk. Should technical factors line up well, we will be looking to build a short exposure in equities (general), and possibly in the precious metals complex. What stands between us going outright short on risk, and being on the sidelines by staying in cash/safety are mostly technical factors. As you will read in the note from Goldman below, there has been, on average, 2 corrections of 5%+ magnitude each year in the U.S. stock market since 2010. U.S. equities experienced only one of such corrections in 2015, and another so far this year. It seems to us that market participants in general have gotten too complacent and have neglected some of the risks aforementioned in the sections above, and have back loaded the nature process of self-correction (in an anti-fragile system). We would not be surprised to see another of such corrections in the near future, given how the risks have been structured. The event horizon will be busy going forward, and we believe big money remains the most clueless in a long time, as to where they should flow. "Sell in May and go away" looks appealing to us. For those wishing to ride out the volatility, staying liquid should be the easiest thing to do. For those who still wish to have a net long exposure to risk, hedging via volatility calls might be an alternative. For those, like us, who intend to be geared riding any serious selloff, it is time to pick your weapons. Of all the major asset classes, and on a beta-adjusted basis, we expect equities, precious metals, and the dollar (USD FX crosses) to be hit the hardest. A highly levered play would be to short the PMs on momentum; not that we will do it but it seems like a logical play. Sell in May, and play it safe! Valuation is a necessary starting point of any drawdown risk analysis. At 16.7x the forward P/E multiple of the S&P 500 index ranks in the 86th percentile relative to the last 40 years. Most other metrics paint a similar picture of extended valuation. The median stock in the index trades at the 99th percentile of historical valuation on most metrics. The most likely future path of US equities involves a lower valuation. Supply and demand trends also suggest downside risk. During the first quarter, the lack of investor positioning in domestic equities was the most bullish argument for a share price rally. Even as the S&P 500 index rebounded from its February 11 low, institutional and hedge fund US equity futures positions remained net short and our Sentiment Indicator hovered near 10 (out of 100). A low sentiment reading represents a bullish trading signal for the subsequent 4-6 weeks. Sentiment has shifted sharply during the past few weeks. Since the end of March, investors have bought $23 billion worth of futures positions, lifting our Sentiment Indicator to 32, a less bullish level compared with mid-winter. Corporate buybacks represent the single largest source of equity demand but may wane during coming months. Most firms completed 1Q earnings season by early May and have now resumed their discretionary buybacks, providing near-term support for the market. The month of May typically witnesses 10% of annual repurchase spending. However, spending normally decelerates in June and again in July, when just 7% of buybacks occurs as companies enter a blackout window ahead of 2Q earnings reports. The fed funds futures market currently implies an 83% probability of zero (41%) or one (42%) rate hike in 2016. Our economists expect two hikes this year. The two upcoming FOMC meetings (June 14-15 and July 26-27) and the July Humphrey-Hawkins testimony to the House and Senate will offer opportunities for Chair Yellen to guide the market in the direction of the FOMC central tendency, which also anticipates two hikes in 2016. Put differently, given current futures market pricing we believe more likelihood exists for an incremental hawkish surprise than a dovish surprise. Now-dormant economic growth concerns could awaken at any time and provide a catalyst for a sell-off. Official “total social financing” data shows China credit growth surged by $1 trillion in 1Q but acceleration in credit creation is needed to prevent a slowdown in activity by 3Q. Decelerating growth in China would cause investors to re-focus on the prospect of a US recession, a topic that has receded from client conversations after dominating discussions in 1Q. Our US-MAP index of economic data surprises has slipped back into negative territory and reinforces the risk of a slowdown. The UK “Brexit” referendum on June 23 represents another imported economic risk. The US presidential election is now part of every client conversation. The closeness of the race appears to be underpriced by the market given polls in prior presidential elections tightened as voting day approached. 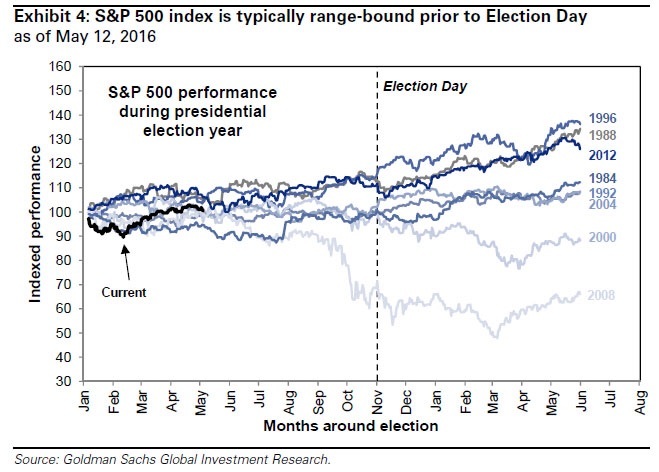 History shows that during a typical presidential election year, the S&P 500 index remains relatively range-bound until November (see Exhibit 4). But thus far 2016 has hardly followed a regular election playbook. The upcoming party conventions (Republicans on July 18-21 and Democrats on July 25-28) will almost assuredly raise political uncertainty and weigh on equity valuations. This coming Thursday, 23 June 2016, the United Kingdom will vote on a historical referendum deciding on the status of its European Union (EU) membership. For the last 2 years since 2014, the UK parliament, led by acting Prime Minister David Cameron have promised a public referendum on Britian's EU membership. Britain's relationship with Europe has always been one of contention, and many have long been awaiting this once in a generational lifetime opportunity to voice their opinions through the democracy of a vote. The global financial markets have also been eying this key event risk for some time, and since events have heated up recently as we enter the final week before the ballots are cast, there has never been a more important 4 days for English markets (that's including the pound sterling, GBP) since the "Black Wednesday" of 1992 , the day the Bank of England was broken by the markets. We are not usually pessimists but when we see the writing on the wall getting bold redder each week that passes, we can't help but to take serious note. Just last week, we warned readers that markets might be about to get nastily volatile during the summer. So far so bad. May hasn't started well at all. The S&P 500, as of the week ending this past Friday, posted its first 3-week losing streak since January. It is a known fact that credit cycles often lead business and economic cycles. It makes sense on paper and even more sense in practice. This is a subject that we havehardly yet touched on, but will be doing so in this piece. For a majority of the investing community, the topic on credit cycles remain much of a novelty. As of March 2016, total default volumes on HY bonds (high yield) and institutional loans in the U.S. hit a 6-year peak of approximately $16.2bn, almost half that seen in the entire of 2015. Just this past week alone, we saw at least 4 corporate defaults with 3 in the energy sector. So far in 2016 (Jan-Mar) default volumes have reached a jaw dropping $32.4bn. To put this in context, 2015's default volume (which was already abnormally high) stood at $37.7bn. If this trend were to continue through 2Q and beyond, we are talking about a full-fledged wave of defaults. The Next Big Trend In Currencies? For the first 3 and a half months that have already elapsed in 2016, no asset class has seen the consistent volatility that currencies have. Central banking has been busy, almost too busy, all while the macro fundamental landscape has hardly moved an inch. With all that drama, noise, and play in monetary policies throughout the global economy, one would expect sizable trends in FX. But that hasn't been the case. For instance, when the ECB first lowered its deposit rate to zero back in the first half of 2015, that sparked a major bear market in the euro, and a bull market in risk assets including euro bonds. When the Fed announced it planned to gradually taper QE3 and eventually end it late in 2014, the U.S. dollar began building up into what we now recognize as one of the most fervent dollar bull markets ever. Monetary policy divergences used to herald the alpha and omega of huge trends. But not today. Now, thanks to a comprehensive piece by Bank of America Merrill Lynch, we can provide readers with a glimps of what might be the next big trend in FX. Last week, Bloomberg broke a story which greatly fascinated us. It involves a mysterious "specter", one which we have no clue about, flooding the Turkish stock exchanges with massive buy orders, massive to the tune of some $450mn in a single day. Turkish locals refer to this entity (whoever or whatever it is) as "the dude", crowning the figure with an amphibious demeanor worth of a chapter in Slenderman. We have no idea, absolutely no idea who or what "the dude" is, how it specifically operates, and what its motives are for slamming a relatively illiquid market with order sizes so large, they scare the living daylights out of even the staunchest of permabears. All we know is that local authorities have been rattled, investors shaken off to the sidelines, and a stock market that is now a stellar outperformer in the emerging market (EM) space. Even with the gruesome terror attacks in Istanbul over the weekends, an attack which has killed at least 37 people the last we checked, the Borsa Istanbul Index has now rallied for the 9th straight day. That's right, we need the U.S. dollar to be BOTH strong AND weak at the same time for continued upside in equities. Much has been said about the greenback ever since the end of the Fed's QE3 program in late 2014. It was then all about king dollar leading up to the Fed's first (in a decade) rate hike in December 2015. Speculators kept piling in on the the freight express train that was the long dollar trade du jour, creating what has become one of the most crowded trades in modern history. It's likely going to be a tug of war between these forces we've highlighted in this piece. Again, we make no predictions as to direction. We do however expect this conundrum to continue until a novel catalyst emerges that alters the way market participants trade and position. What this novel catalyst is, we don't know. This conundrum is big, as we shall explain below. The top 0.01% of the erudite elites control more than 60% of the world's wealth, while the 80% of us have a collective net worth less than the top 1% of society. In a world decorated with such gaping inequalities, risk and opportunities present themselves. While problems may be plentiful, there are also long term opportunities to capitalize on the mother of all trends: A globally aging demographic. Which is what Janus Capital's Bill Gross, well revered as being called the "Bond King", is driving at in his latest investment outlook. In the race between the tortoise and the hare, the former analogous to a gradually aging population, the latter to technological advancements, the tortoise eventually catches up. Time isn't on our side, and we're sitting in a ticking time bomb. It's a known fact that a large majority of the world's baby boomers are not adequately primed for retirement, lack the financial resources to meet mounting healthcare and insurance obligations as they further age, and are more dependent on the state's hospitality than ever before. But who pays the ultimate price? The prospect of $20 oil prices has been raised thanks to this one Black Swan. A Black Swan is also known to statisticians as tail risk, or events that are highly improbable but are of great significance. One can liken such an even to a large meteoroid making its way through the Earth's protective atmosphere and impacting land or sea; an extremely unlikely event but if actually true, mankind's existence would be threatened. Low oil prices have been the bane of many oil producing and export nations, whose currencies and economies have taken incessant hits every cent crude continues to plunge. The ruthless combination of a huge supply overhang and waning global demand has led to a deadly concoction oil producers and exporters have no choice but to drink. What other choices would they have anyways? Whatever we said on 5 November came true. For the first time in 9 years, the Fed hiked the Fed Funds target interest rate by 25bp to 0.25-0.5%, ending an eon of zero lower ground rates and marking the start of a new paradigm. A paradigm that is, much as most would hate to admit, unprecedented in terms of scale and bredth. As we approached 16 December, markets had increasingly discounted a Fed liftoff, but there was still some element of uncertainty. That uncertainty now shifts to what the Fed will do in 2016. Will it continue to gradually hike rates? Will it reverse on its path of monetary tightening and start to ease? These are but a multitude of questions that everyone is asking, but no one can really answer. Are Central Banks Preparing For A December Fed Liftoff? Does dovish rhetoric from Europe's ECB, continued stimulus from China's PBoC, the reluctance of Japan's BoJ to step up QQE despite headwinds, New Zealand's RBNZ policy being put on hold signal a soon imminent Fed rate hike? While correlation might not necessarily be causation, especially in the ubiquitously tangled web of central banking, we believe this development is too significant to turn a blind eye on. Ironically, market-based odds for a December Fed rate hike have never been higher. Do central bankers know something about the Fed's near term actions which the general market doesn't? If anyone knows what the other will do, it's probably them. We'll leave this up to you to decide. The proof is in the pudding, and this one's pretty dense. So take it for what it is, we're playing it cautious but not holding our breaths.